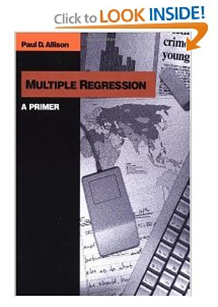 1.1 What is multiple regression? 1.2 What is multiple regression good for? 1.3 Are there other names for multiple regression? 1.4 Why is multiple regression so popular? 1.5 Why is regression “linear” ? 1.6 What does a linear equation look like with more than two variables? 1.7 Why does multiple regression use linear equations? 1.8 What kinds of data are needed for multiple regression? 1.9 What kinds of variables can be used in multiple regression? 1.10 What is ordinary least squares? 1.11 How can we judge how good the predictions are? 1.12 How do we judge how good the coefficient estimates are? 1.13 How does multiple regression “control” for variables? 1.14 Is multiple regression as good as an experiment?